Languedoc & Roussillon: "wines of the mo"
Domaine Denois 'Sainte Marie' Limoux blanc 2010 (single site "high-altitude" Chardonnay, barrel-fermented/aged) - the best of the three whites we tasted, I found it pretty much as I remembered it as per this note here (including more info on JL Denois and the wine). Touch of class. €15 cellar door. Château de Cazeneuve 'Cynarah' Pic Saint-Loup 2011 (Cinsault, Syrah, Grenache) - attractive juicy ripe black cherry and liquorice fruit, soft tannins and rounded mouth-feel with a touch of earthy spice and mint. £12.95 the Wine Society. Previously on Cazeneuve. Domaine Modat 'Comme Avant' Côtes du Roussillon Villages Caramany 2010 (Grenache, Syrah, Carignan from some of the oldest vines; half of it aged in new oak for 16 months) - a popular choice, I've already reviewed it here where you'll find more about the producer too. Nice mouthful of Med red, a tad expensive though. James Nicholson £14.95 / €21.80. 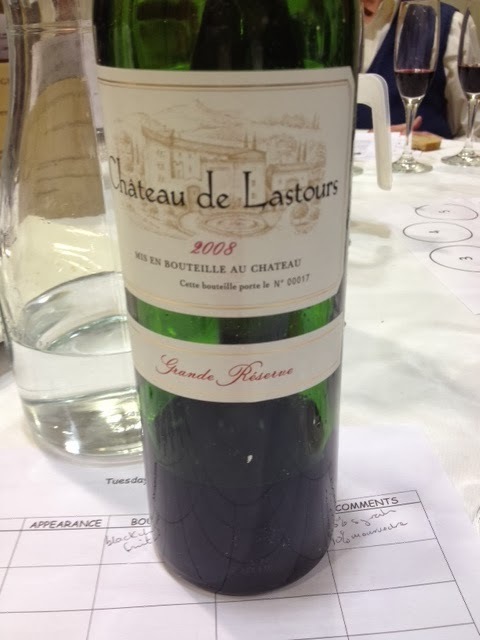 Château de Lastours 'Grande Réserve' Corbières 2008 (Syrah, Carignan, Grenache, Mourvèdre: oldest vine selection 30 to 40 y.o; 75% of the blend aged 1 year in French oak) - attractive maturing smoky savoury and dried fruit side vs concentrated and still fairly firm structure, well balanced too. c. €18. More Lastours here. Laurent Miquel 'Bardou' Saint Chinian 2008 Grande Cuvée (mostly Syrah from selected sites on the Cazal Viel estate, 14 months in French oak - 55% new) - another pretty serious red I'd tasted previously (goes to my special supplement on St Chinian inc. profile on Miquel and notes on several wines), showing a fair bit of oak but it's concentrated and structured with nice fruit. £16 Excel Wines, €20.99 Dunnes. Domaine Cazes Rivesaltes ambré 2000 (100% Grenache blanc fortified to 16% abv, aged 7+ years in old tuns, 118 g/l residual sugar) - classic style with enticing oxidized walnut/pecan notes, complex flavours with nice sweet vs tangy and savoury finish and a bit of 'cut'. Liberty Wines approx retail £15 half-bottle. Lots more old Cazes here. Germany, Mosel: Selbach-Oster Riesling Kabinett 2006 - lovely example of delicate yet characterful mature Riesling with all that intricate oily 'kerosene' thing going on, rounded medium-dry palate with a touch of lingering fresh acidity underneath still, elegant long finish. Plenty of complex flavour for an unoaked white wine with 10.5% abv. James Nicholson list price about £14 I think (now sold out), although I got it in their sale for less than a tenner. South Africa, Stellenbosch: Rustenberg RM Nicholson 2009 (50% Cabernet Sauvignon, 40% Syrah, 5% Petit Verdot, 3% Cabernet Franc, 2% Malbec) - very attractive traditional style SA red blend with power and weight (14.5% abv), smoky with dark berry fruit richness, still structured and chunky with nice tannins though, lovely depth, concentration and balance. Will keep longer but enjoy it now with hearty winter food. James Nicholson list price £12.50, about 30% off in their sale. Spain, Rioja: Campo Viejo Gran Reserva 2007 (mostly Tempranillo) - considering CV is now a massive international brand, they still manage to produce good quality, classic style Reserva and Gran Reserva barrel-aged Rioja styles, this delivers very nicely with smooth maturing fruit and light vanilla edges. Sainsbury's £15.99, £11.99 on offer. Argentina, Valle de Uco, Mendoza: Melisa Malbec 2012 (13.5% abv) - nice aromatic violet and herby spicy elderberry nose with underlying darker black cherry and savoury notes, peppery crunchy cran/elderberry fruit vs riper cassis and cherry, quite soft tannins and a bit of oomph, sweet liquorice vs white peppery and wild herby, a bit of weight and grip vs fresh bite. Naked Wines £8.49 - apparently £10,000 of the money earned helped fund a study scholarship for winemaker Patricio Gougenheim's employees' children.